Here are the top 20 Entrecard droppers on my blog for February. Thanks to all of you! Pepper Spray, Stun Guns, and Tasers... Oh My! Please take a moment to vote in the February poll, if you haven't already done so. A new poll for March will be posted tomorrow. Some of you may be familiar with the Author's Attic site where you can buy your very own Claire's ring, Brianna's bracelet, and many other pieces of OUTLANDER-themed jewelry. 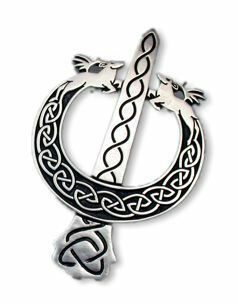 Michelle Moore (aka M&M), who came up with the designs for those items, announced yesterday on LOL that a running stag brooch (similar to the one on the cover of FIERY CROSS) is now available for purchase. DISCLAIMER: Please note, I have absolutely no connection to the site selling these items! I'm just doing what I can to help spread the word to other OUTLANDER fans out there. If you have questions about the jewelry, please send an email to theauthorsattic@gmail.com, or leave a comment for Michelle on the LOL page I linked to above. Thanks for letting folk know. I ought probably to add my own disclaimer here--in that I have nothing whatever to do with this (or any other OUTLANDER-themed) enterprise. I gave Michelle permission (with the additional permission of the original designer) to use the design for Claire's ring and the running-stag brooch (to which I own the copyright), but I have no control over her company nor do I have any kind of financial interest in it. I'm pleased that people seem to like the jewelry and admire Michelle's good running of her company, but I don't have anything at all to do with it personally. Diana Gabaldon now has a channel on YouTube, where you can find all sorts of OUTLANDER-related videos collected in one place: casting videos, interviews with Diana, the interview with Davina Porter that I mentioned here recently, and more. 1) DO NOT email Diana through YT! To circumvent a box full of email, they have created a new Yahoo account for YT mail and Diana has the password as well. So in theory she can check it, but in reality, Nikki would be the one answering the mails. 2) Folks can comment on the page and Nikki or Diana will respond. 3) If anyone has a video they want put on the channel, they can post a comment or send an email to dianagabaldon@ymail.com. This email address is to be used ONLY for things relating to the YT channel. This is NOT Diana's main email account. If you'd like to leave a comment for Nikki on Compuserve, the thread that mentions the YouTube channel is here. One of the things that fascinates me about the OUTLANDER books is the detailed descriptions of places that I have never seen in real life. Here is a collection of links featuring famous places described in the books. Except for Versailles (which I saw on a trip to France almost 25 years ago), I have never seen any of these places myself. I'm still hoping to be able to visit Scotland some day! Among the scenes of Highland beauty and massed MacKenzies were several photographs of the clan seat--Castle Leod. "You're kidding!" I said, seeing this. "You mean there is a place called Leod?" "Well, I have seen it," I said. "But not in a photograph." 2) Tryon Palace, New Bern, NC - Built by Governor William Tryon of North Carolina as the colonial governor's residence; evacuated by Governor Josiah Martin in 1775. They'd finished the place, and very nicely, too. William Tryon, the previous governor, had built the Governor's Palace, but had been sent to New York before construction had been finished. Now the enormous brick edifice with its graceful spreading wings was complete, even to the lawns and ivy beds that lined the drive, though the stately trees that would eventually surround it were mere saplings. 3) Beauly Priory - The priory attached to Beaufort Castle, where Claire meets Maisri the seer. We rode unchallenged into the courtyard of Beaufort Castle, a small edifice as castles went, but sufficiently imposing, for all that, built of the native stone. Not so heavily fortified as some of the castles I had seen to the south, it looked still capable of withstanding a certain amount of abrasion. Wide-mouthed gun-holes gaped at intervals along the base of the outer walls, and the keep still boasted a stable opening onto the courtyard. 5) Rose Hall, Jamaica - All right, this isn't precisely a castle or a palace, but I couldn't resist including this link, because it refers to the legend of the White Witch. 6) Holyrood Palace - This is the palace where Jamie and Claire lived for a few weeks during Charles Stuart's return to Edinburgh in the fall of 1745. It's also the place where Colum MacKenzie died. The long, high-ceilinged room with its two vast fireplaces and towering windows had been the scene of frequent balls and parties since Charles's triumphant entry into Edinburgh in September. Now, crowded with the luminaries of Edinburgh's upper class, all anxious to do honor to their Prince--once it appeared that he might actually win--the room positively glittered. 7) Versailles - I love the pictures on this site. 8) Finally, to put all these places in their proper context, take a look at Jari Backman's GoogleEarth OUTLANDER page, where you can download a file that lets you view the various places mentioned in the books in their proper locations around the world. Great job, Jari! This is the "Mallard Fillmore" comic strip from Feb. 11. Thanks to Margaret Campbell on Compuserve for pointing this one out. I think this is hilarious. What about the rest of you? UPDATE 2/11/09 1:20 pm: Diana has posted her reaction on Compuserve. Check it out! Here's a selection of photos I found on www.webshots.com, showing some of the places described in the OUTLANDER books. Enjoy! Diana just posted on her blog a picture of the proposed cover art for the U.S. edition of AN ECHO IN THE BONE. I would strongly encourage you all to go take a look at it! I think it looks fantastic, about as good as I could have hoped for. In fact I'm quite excited to see it! As Tess pointed out on Compuserve, if we're talking about jewel-tone covers, this one is apparently the black diamond. I like that idea a lot. What do the rest of you think? 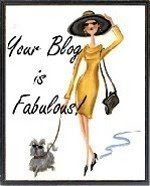 Feel free to comment here, or on Diana's blog, or join the discussion on Compuserve, here. I've seen the "Thursday Thirteen" meme on a number of sites recently, so I thought I'd give it a try myself. 1) I didn't know that there had been Scottish settlers in colonial North Carolina, let alone that they were so influential. 2) I'd heard of Stonehenge, of course, but I had no idea that there were stone circles elsewhere in the world. 3) I knew nothing at all about Scottish history before I read these books. "Culloden", to me, was a brand of water faucet I'd seen advertised on TV, and nothing more. 5) I didn't know that I could come to appreciate, let alone be addicted to, audiobooks. I've been a voracious reader all my life, but never listened to audiobooks except on long car trips, until I found the OUTLANDER unabridged CDs. Davina Porter's readings are just wonderful! 6) I had no idea that the Compuserve Books and Writers Forum existed. Finding that online community has changed my life, and I am not exaggerating when I say that. 7) I'd never heard of a great many of the strange and unusual words Diana has used in her books: "raillery", "niff", "chisping", "coccygodynia", and "poltroon", to name just a few of my favorites. These books have done wonders for my vocabulary! 10) I wasn't aware that anybody in Scotland spoke Gaelic. 11) I didn't know that wolf-dog crossbreeding was possible, let alone that people could keep them as pets. 12) I knew nothing whatever about the lifestyles of gay men in 18th century London. 13) And finally...it would never have occurred to me that best-selling authors are people too. <g> Diana is remarkably down-to-earth and easy to talk to online, once you get over the fact that you are talking to a famous author. What do you think about the OUTLANDER graphic novel? For those of you who chose that last option: If you want to find out more about the OUTLANDER graphic novel, look here for Diana's explanation of what it is, and here and here for sample pages of the script and artwork. If you have a different quote that you would have liked to see in this list, feel free to post it here. I'm always interested to hear what people think. Finally, I would like to thank Jari Backman for his continuing help with the "Notable Dates This Month" feature on my blog. Jari provided most of the dates listed here for February, as he's done for the last few months. Please keep it up, Jari, you know I appreciate it very much!